Since I work from home now, my wardrobe has become much more relaxed - but not sloppy. 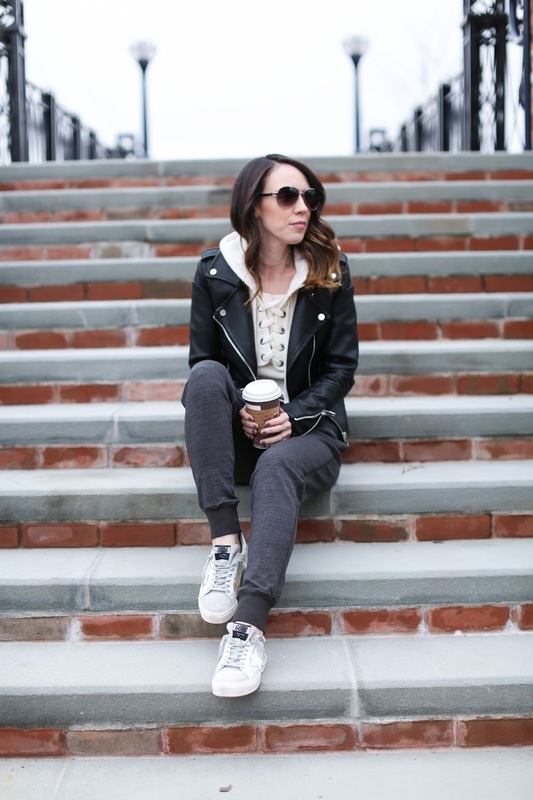 I actually got rid of any old frumpy sweats in favor of buying things that I could wear comfortably around the house but can still head out to lunch, or a meeting without needing to change. I have really been loving lace-up sweaters right now. While they skew more towards a casual look, I enjoy that there is extra detailing which make them more interesting than a simple boring sweatshirt. I refuse to accept that comfortable and casual must mean ill-fitting, unflattering or not without any thought put into it. In other non-fashion news, I am still in shock over the Oscars last night! Talk about awkward. Yowza! Sadly, I am wayyyy behind on watching all the contenders this year so I foresee a ton of movie dates in my near future. What was your favorite out of the two - Lalaland or Moonlight?! Which should I see first? !